WORK AT RANDOLPH AIR FORCE BASE? Click Here! We are one of the leading auto repair shops serving customers in Universal City, TX, Schertz, TX, Converse TX, and surrounding areas. All automotive repair and mechanic services at Victory Lane Automotive are performed by highly qualified mechanics. Our mechanic shop works on numerous vehicles with the use of quality truck and car repair equipment. Whether you drive a passenger car, medium sized truck, mini-van, or SUV, our mechanics strive to ensure that your vehicle will be performing at its best before leaving one of our service bays. Our auto repair shop is capable of servicing a variety of makes and models. Our superior standards show that our mechanics always have the best interests of our customers in mind. 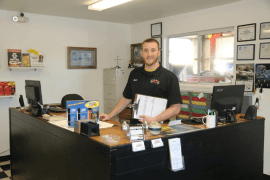 Looking for a one-stop automotive repair shop? Look no further than us, and allow our mechanics to give you a reliable estimate of any automotive repair issue you might be facing. Our number one goal has always been complete satisfaction for customers in Converse TX | Schertz TX | Universal City TX | San Antonio TX | Selma TX | Cibolo TX and surrounding areas. Our car repair shop has a longstanding reputation for quality repairs. Whether you need routine auto maintenance services or necessary car repairs, contact us online or visit us during business hours.